The present invention relates to a mild body wash composition containing a surfactant component containing a nonionic surfactant having an HLB of from about 1.5 to 13.0, an anionic surfactant, an electrolyte; and the surfactant component has a structured domain. This application claims the benefit of provisional application No. 60/548,740, filed Feb. 27, 2004. The present invention relates to a mild body wash composition comprising a surfactant component comprising at least one nonionic surfactant having an HLB from about 1.5 to 13.0, at least one anionic surfactant, an electrolyte; and wherein said surfactant component has an opaque structured domain. Personal care composition products like body washes are becoming more popular in the United States and around the world. Desirable body wash compositions must meet a number of criteria. For example, in order to be acceptable to consumers, a body wash composition must exhibit good cleaning properties, must exhibit good lathering characteristics, must be mild to the skin (not cause drying or irritation) and preferably should even provide a conditioning benefit to the skin. Body wash compositions that attempt to provide skin-conditioning benefits are known. Many of these compositions are aqueous systems comprising an emulsified conditioning oil or other similar materials in combination with a lathering surfactant. Although these products provide both conditioning and cleansing benefits, it is often difficult to formulate a product that deposits sufficient amount of skin conditioning agents on skin during use. In order to combat emulsification of the skin conditioning agents by the cleansing surfactant, large amounts of the skin conditioning agent are added to the compositions. However, this introduces another problem associated with these cleansing and conditioning products. Raising the level of skin conditioning agent in order to achieve increased deposition negatively affects product lather performance and stability. Accordingly, the need still remains for stable mild body wash composition that provides cleansing with increased lather longevity and improved lathering characteristics, and skin benefits such as silky skin feel, improved soft skin feel, and improved smooth skin feel. It is therefore an object of the present invention to provide a body wash composition comprising surfactants having a structured phase that can be combined with high levels of skin conditioning materials that are emulsified in the composition preferably being suspended in such a way so that the skin conditioning materials can be deposited at higher levels while at the same time maintaining superior performance versus conventional body washes. The present invention further relates to a mild, multi-phased body wash composition comprising at least two visually distinct phases; wherein the phases form a pattern; wherein said composition comprises; a surfactant component comprising; a nonionic surfactant having an HLB from about 3.4 to 13.0; a anionic surfactant; an electrolyte; and wherein said composition has a structured domain; and wherein said phases are packaged in physical contact with one another and maintain stability. The present invention is also directed to a method of cleansing, moisturizing and delivering skin benefit agents and particles to the skin by applying to the skin a composition as described above. The mild body wash composition of the present invention comprises a surfactant component comprising a nonionic surfactant having an HLB from about 1.5 to 13.0, an anionic surfactant, an electrolyte; and wherein said composition comprises a structured domain. These and other essential limitations of the compositions and methods of the present invention, as well as many of the optional ingredients suitable for use herein, are described in detail hereinafter. The term “anhydrous” as used herein, unless otherwise specified, refers to those compositions or materials containing less than about 10%, more preferably less than about 5%, even more preferably less than about 3%, even more preferably zero percent, by weight of water. The term “ambient conditions” as used herein, refers to surrounding conditions at one (1) atmosphere of pressure, 50% relative humidity, and 25° C.
The term “cosmetically efficacious level” as used herein, is a level conferring a benefit during use of the composition. The term “Consistency value” or “k” as used herein is a measure of viscosity and is used in combination with Shear Index, to define viscosity for materials whose viscosity is a function of shear. The measurements are made at 25° C. and the units are poise (equal to 100 centipoise). The term “hydrophobically modified interference pigment” or “HMIP”, as used herein, means a portion of the interference pigment surface has been coated, including both physical and chemical bonding of molecules, with a hydrophobic material. As used herein “domain” means a volume of material, component, composition or phase comprising a molecular mixture which can be concentrated but not further separated by physical forces such as ultracentrifugation. For example, surfactant lamellar, surfactant micellar, surfactant crystal, oil, wax, water-glycerine mixture, hydrated hydrophilic polymer all constitute domains which can be concentrated and observed by ultracentrifugation, but which cannot be further separated into distinct molecular components by the same forces. The term “interference pigment”, as used herein, means a pigment with pearl gloss prepared by coating the surface of a particle substrate material (generally platelet in shape) with a thin film. The thin film is a transparent or semitransparent material having a high refractive index. The higher refractive index material shows a pearl gloss resulting from mutual interfering action between reflection and incident light from the platelet substrate/coating layer interface and reflection of incident light from the surface of the coating layer. By the term “multi-phased” or “multi-phase” as used herein, is meant that the at least two phases herein occupy separate but distinct physical spaces inside the package in which they are stored, but are in direct contact with one another (i.e., they are not separated by a barrier and they are not emulsified or mixed to any significant degree). In one preferred embodiment of the present invention, the “multi-phased” personal care compositions comprising at least two phases are present within the container as a visually distinct pattern. The pattern results from the mixing or homogenization of the “multi-phased” composition. The patterns include but are not limited to the following examples: striped, marbled, rectilinear, interrupted striped, check, mottled, veined, clustered, speckled, geometric, spotted, ribbons, helical, swirl, arrayed, variegated, textured, grooved, ridged, waved, sinusoidal, spiral, twisted, curved, cycle, streaks, striated, contoured, anisotropic, laced, weave or woven, basket weave, spotted, and tessellated. Preferably the pattern is selected from the group consisting of striped, geometric, marbled and combinations thereof. In a preferred embodiment the striped pattern may be relatively uniform and even across the dimension of the package. Alternatively, the striped pattern may be uneven, i.e. wavy, or may be non-uniform in dimension. The striped pattern does not need to necessarily extend across the entire dimension of the package. The phases may be various different colors, or include particles, glitter or pearlescence. The term “mild body wash composition” as used herein, refers to compositions intended for topical application to the skin or hair. The term “opaque” structured domain as used herein, refers to a surfactant domain with ordered structures (e.g., lamellar structure, vesicule structure, cubic structure, etc.) and it is visually opaque to a naked eye in a 10 mm inner diameter plastic centrifuge tube after the Ultracentrifugation Method described herein. The term “phases” as used herein, refers to a region of a composition having one average composition, as distinct from another region having a different average: composition, wherein the regions are visible to the naked eye. This would not preclude the distinct regions from comprising two similar phases where one phase could comprise pigments, dyes, particles, and various optional ingredients, hence a region or domain of a different average composition. The term “Shear Index” or “n” as used herein is a measure of viscosity and is used in combination with Consistency value, to define viscosity for materials whose viscosity is a function of shear. The measurements are made at 25° C. and the units are dimensionless. The term “stable” as used herein, unless otherwise specified, refers to compositions that maintain at least two “separate” phases when sitting in physical contact at ambient conditions for a period of at least about 180 days wherein the distribution of the two phases in different locations in the package does not change over time. By “separate” is meant that the well-distributed nature of the visually distinct phases is compromised, such that larger regions of at least one phase collect until the balanced dispensed ratio of the two or more compositions relative to each other is compromised. The phrase “substantially free of” as used herein, means that the composition comprises less than about 3%, preferably less than about 1%, more preferably less than about 0.5%, even more preferably less than about 0.25%, and most preferably less than about 0.1%, by weight of the composition, of the stated ingredient. The Vaughan Solubility Parameter (VSP) as used herein is a parameter used to define the solubility of hydrophobic compositions comprising hydrophobic materials. Vaughan Solubility parameters are well known in the various chemical and formulation arts and typically have a range of from about 5 to about 25 (cal/cm3)1/2. All percentages, parts and ratios as used herein are by weight of the total composition, unless otherwise specified. All such weights as they pertain to listed ingredients are based on the active level and, therefore do not include solvents or by-products that may be included in commercially available materials, unless otherwise specified. The mild body wash compositions and methods of the present invention can comprise, consist of, or consist essentially of, the essential elements and limitations of the invention described herein, as well as any additional or optional ingredients, components, or limitations described herein or otherwise useful in personal care compositions intended for topical application to the hair or skin. The mild body wash composition of the present invention is typically in the form of a liquid. The term “liquid” as used herein means that the composition is generally flowable to some degree. “Liquids”, therefore, can include liquid, semi-liquid, cream, lotion or gel compositions intended for topical application to skin. The compositions typically exhibit a viscosity of equal to or greater than about 1,500 cps to about 1,000,000 cps, as measured by the Viscosity Method as described in copending application Ser. No. 60/542,710 filed on Feb. 6, 2004. When evaluating a mild body wash composition comprising a surfactant component and additional benefit components, the body wash can be separated by a separation means, including centrifugation, ultracentrifugation, pipetting, filtering, washing, dilution, or combination thereof, and then the separate components can be evaluated. Preferably, the separation means is chosen so that the resulting separated components or phases being evaluated is not destroyed, but is representative of the component as it exists in the mild body wash composition. If the composition is multi-phased and the phases are combined, each phase can be separated by centrifugation, ultracentrifugation, pipetting, filtering, washing dilution, or combination thereof, and then the separate phases can be evaluated. All of the product forms contemplated for purposes of defining the compositions and methods of the present invention are rinse-off formulations, by which is meant the product is applied topically to the skin or hair and then subsequently (i.e., within minutes) the skin or hair is rinsed with water, or otherwise wiped off using a substrate or other suitable removal means with deposition of a portion of the composition. The mild body wash composition of the present invention comprises a surfactant component comprising a surfactant or a mixture of surfactants. The surfactant component comprises surfactants suitable for application to the skin or hair. The general categories of alkyl amines and alkanolamines are less preferred surfactants, because such surfactants tend to be less mild than other suitable surfactants. In a preferred embodiment of the present invention, the mild body wash composition is substantially free of alkyl amines and alkanolamines. Suitable surfactants for use herein include any known or otherwise effective cleansing surfactant suitable for application to the skin, and which is otherwise compatible with the other essential ingredients in the mild body wash composition including water. These surfactants include anionic, nonionic, cationic, zwitterionic or amphoteric surfactants, soap or combinations thereof. Preferably the surfactant component comprises a mixture of at least one nonionic surfactant, at least one anionic surfactant and at least one amphoteric surfactant. In a preferred embodiment the mild body wash composition is substantially free of a polysiloxane. The surfactant component in the present invention exhibits Non-Newtonian shear thinning behavior. Preferably, the mild body wash composition has a viscosity of greater than about 1,500 centipoise (“cps”), more preferably greater than about 5,000 cps, even more preferably greater than about 10,000 cps, and still more preferably greater than about 20,000 cps, as measured by the Viscosity Method described in copending application Ser. No. 60/542,710 filed on Feb. 6, 2004. The surfactant component comprises an opaque structured domain comprising a structured surfactant system. The opaque structured domain enables the incorporation of high levels of benefit components that are emulsified in the composition, preferably being suspended in such a way so that the benefit components can be deposited at higher levels. The opaque structured domain is preferably a lamellar phase. The lamellar phase produces a lamellar gel network that is a type of colloidal system. The lamellar phase provides resistance to shear, adequate yield to suspend particles and droplets and at the same time provides long term stability, since they are thermodynamically stable. The lamellar phase yields a higher viscosity without the need for viscosity modifiers. Preferably, the surfactant component has a Yield Point of greater than about 0.1 Pascal (Pa), more preferably greater than about 0.5 Pascal, even more preferably greater than about 1.0 Pascal, still more preferably greater than about 2.0 Pascal, still even more preferably greater than about 5 Pascal, and even still even more preferably greater than about 10 Pascal as measured by the Yield Point methodology described hereafter. The mild body wash composition comprising a surfactant component has a Structured Domain Volume Ratio of at least about 70%, preferably at least about 75%, more preferably at least about 80%, even more preferably at least about 85% as measured by the Ultracentrifugation Method described hereafter. The mild body wash composition preferably comprises a surfactant component at concentrations ranging from about 1% to about 95%, preferably 5% to about 95%, more preferably from about 25% to about 90%, even more preferably from about 35% to about 88%, still more preferably from about 40% to about 85%, and still even more preferably from about 45% to about 85%, by weight of the body wash composition. The surfactant component comprises the surfactant at concentrations ranging from about 8% to −50%, preferably about 10% to about 35%, preferably about 12% to about 30%, more preferably about 14% to about 24.5%, and even more preferably about 20% to about 24%. The preferred pH range of the mild body wash is from about 5 to about 8, more preferably about 6. In a preferred embodiment of the present invention the mild body wash composition is a mild, multi-phase wash comprising at least two visually distinct phases; wherein at least one phase is a cleansing phase; wherein said cleansing phase comprises a surfactant component comprising a surfactant or a mixture of surfactants. When the surfactant component is present in the multi-phased personal care composition, the surfactant component comprises a structured domain that enables the incorporation of high levels of benefit components in a visually distinct phase that are not emulsified in the composition but suspended. The structured domain is preferably an opaque structured domain. The opaque structured domain is preferably a lamellar phase. The multi-phased composition comprising the surfactant component has a Structured Domain Volume Ratio of at least about 45%, preferably at least about 50%, more preferably at least about 55%, even more preferably at least about 60%, still more preferably at least about 65%, still even more preferably at least about 70%, and still even still more preferably at least about 80% as measured by the Ultracentrifugation Method described hereafter. The mild body wash composition preferably comprises at least one nonionic surfactant. Preferably the nonionic surfactant has an HLB from about 1.5 to 13.0, preferably from about 3.4 to 13.0, more preferably 3.4 to about 9.5, more preferably 3.4 to about 5.0. The mild body wash composition preferably comprises a nonionic surfactant at concentrations ranging from about 0.1% to about 50%, more preferably from about 0.25% to about 30%, even more preferably from about 0.5% to about 25%, still even more preferably from about 1.0% to about 20%, and still even still more preferably from about 1.5% to about 10%, by weight of the surfactant component. Non-limiting examples of nonionic surfactants for use in the compositions of the present invention are disclosed in McCutcheon's, Detergents and Emulsifiers, North American edition (1986), published by allured Publishing Corporation; and McCutcheon's, Functional Materials, North American Edition (1992). Nonionic lathering surfactants useful herein include those selected from the group consisting of alkyl glucosides, alkyl polyglucosides, polyhydroxy fatty acid amides, alkoxylated fatty acid esters, lathering sucrose esters, amine oxides, and mixtures thereof. Non-limiting examples of preferred nonionic surfactants for use herein are those selected form the group consisting of C8-C14 glucose amides, C8-C14 alkyl polyglucosides, sucrose cocoate, sucrose laurate, and mixtures thereof. In a preferred embodiment the nonionic surfactant is selected from the group consisting of glyceryl monohydroxystearate, Steareth-2, hydroxy stearic acid, propylene glycol stearate, PEG-2 stearate, sorbitan monostearate, glyceryl stearate, laureth-2 and mixtures thereof. In a preferred embodiment the nonionic surfactant is Steareth-2. Nonionic lathering surfactants also useful herein include, lauramine oxide, cocoamine oxide. The balance between the hydrophilic and lipophilic moieties in a surfactant molecule is used as a method of classification (hydrophile-lipophile balance, HLB). The HLB values for commonly-used surfactants are readily available in the literature (e.g., HLB Index in McCutcheon's Emulsifiers and Detergents, MC Publishing Co., 2004). For example, cocamide monoethanolamine (CMEA) is known in the art to have an HLB value of 16.8. Another way of obtaining HLB values is to estimate by calculations. The HLB system was originally devised by Griffin (J. Soc. Cosmetic Chem., 1, 311, 1949). Griffin defined the HLB value of a surfactant as the mol % of the hydrophilic groups divided by 5, where a completely hydrophilic molecule (with no non-polar groups) had an HLB value of 20. Other examples of how to calculate HLB values are described by Davies in Interfacial Phenomena, 2nd Edition, Academic Press, London, 1963 and by Lin in J. Phys. Chem. 76, 2019-2013, 1972. The mild body wash composition preferably comprises at least one anionic surfactant. The mild body wash composition preferably comprises an anionic surfactant at concentrations ranging from about 1% to about 50%, more preferably from about 4% to about 30%, even more preferably from about 5% to about 25%, by weight of the surfactant component. Preferably the anioninc surfactant is selected from the group consisting of alkyl ether sulfates, alkyl sulfonates and mixtures thereof. Anionic surfactants suitable for use in the mild body wash composition include alkyl and alkyl ether sulfates. These materials have the respective formula ROSO3M and RO(C2H4O)xSO3M, wherein R is alkyl or alkenyl of from about 8 to about 24 carbon atoms, x is 1 to 10, and M is a water-soluble cation such as ammonium, sodium, potassium and triethanolamine. The alkyl ether sulfates are typically made as condensation products of ethylene oxide and monohydric alcohols having from about 8 to about 24 carbon atoms. Preferably, R has from about 10 to about 18 carbon atoms in both the alkyl and alkyl ether sulfates. The alcohols can be derived from fats, e.g., coconut oil or tallow, or can be synthetic. Lauryl alcohol and straight chain alcohols derived from coconut oil are preferred herein. Such alcohols are reacted with about 1 to about 10, preferably from about 3 to about 5, and more preferably with about 3, molar proportions of ethylene oxide and the resulting mixture of molecular species having, for example, an average of 3 moles of ethylene oxide per mole of alcohol, is sulfated and neutralized. Specific examples of alkyl ether sulfates which may be used in the mild body wash composition are sodium and ammonium salts of coconut alkyl triethylene glycol ether sulfate; tallow alkyl triethylene glycol ether sulfate, and tallow alkyl hexaoxyethylene sulfate. Highly preferred alkyl ether sulfates are those comprising a mixture of individual compounds, said mixture having an average alkyl chain length of from about 10 to about 16 carbon atoms and an average degree of ethoxylation of from about 1 to about 4 moles of ethylene oxide. Other suitable anionic surfactants include water-soluble salts of the organic, sulfuric acid reaction products of the general formula [R1—SO3—M], wherein R1 is chosen from the group consisting of a straight or branched chain, saturated aliphatic hydrocarbon radical having from about 8 to about 24, preferably about 10 to about 18, carbon atoms; and M is a cation. Suitable examples are the salts of an organic sulfuric acid reaction product of a hydrocarbon of the methane series, including iso-, neo-, ineso-, and n-paraffins, having about 8 to about 24 carbon atoms, preferably about 10 to about 18 carbon atoms and a sulfonating agent, e.g., SO3, H2SO4, oleum, obtained according to known sulfonation methods, including bleaching and hydrolysis. Preferred are alkali metal and ammonium sulfonated C10-18 n-paraffins. Other suitable surfactants are described in McCutcheon's, Emulsifiers and Detergents, 1989 Annual, published by M. C. Publishing Co., and in U.S. Pat. No. 3,929,678. Preferred anionic surfactants for use in the mild body wash composition include ammonium lauryl sulfate, ammonium laureth sulfate, triethylamine lauryl sulfate, triethylamine laureth sulfate, triethanolamine lauryl sulfate, triethanolamine laureth sulfate, monoethanolamine lauryl sulfate, monoethanolamine laureth sulfate, diethanolamine lauryl sulfate, diethanolamine laureth sulfate, lauric monoglyceride sodium sulfate, sodium lauryl sulfate, sodium laureth sulfate, potassium laureth sulfate, sodium lauryl sarcosinate, sodium lauroyl sarcosinate, lauryl sarcosine, cocoyl sarcosine, ammonium cocoyl sulfate, ammonium lauroyl sulfate, sodium cocoyl sulfate, sodium lauroyl sulfate, potassium cocoyl sulfate, potassium lauryl sulfate, monoethanolamine cocoyl sulfate, sodium tridecyl benzene sulfonate, sodium dodecyl benzene sulfonate, and combinations thereof. Anionic surfactants with branched alkyl chains such as sodium trideceth sulfate, for example, are preferred in some embodiments. Mixtures of anionic surfactants may be used in some embodiments. In some embodiments of the mild body wash compositions of the present invention may further preferably comprise an amphoteric surfactant, a zwitterionic surfactant and mixtures thereof. In one embodiment, the mild body wash composition may further preferably comprise at least one amphoteric surfactant. The mild body wash composition preferably comprises an amphoteric surfactant at concentrations ranging from about 1% to about 50%, more preferably from about 2% to about 30%, even more preferably from about 3% to about 25%, by weight of the surfactant composition. Amphoteric surfactant suitable for use in the present invention include those that are broadly described as derivatives of aliphatic secondary and tertiary amines in which the aliphatic radical can be straight or branched chain and wherein one of the aliphatic substituents contains from about 8 to about 18 carbon atoms and one contains an anionic water solubilizing group, e.g., carboxy, sulfonate, sulfate, phosphate, or phosphonate. Examples of compounds falling within this definition are sodium 3-dodecyl-aminopropionate, sodium 3-dodecylaminopropane sulfonate, sodium lauryl sarcosinate, N-alkyltaurines such as the one prepared by reacting dodecylamine with sodium isethionate according to the teaching of U.S. Pat. No. 2,658,072, N-higher alkyl aspartic acids such as those produced according to the teaching of U.S. Pat. No. 2,438,091, and the products described in U.S. Pat. No. 2,528,378. Amphoacetates and diamphoacetates may also be used. 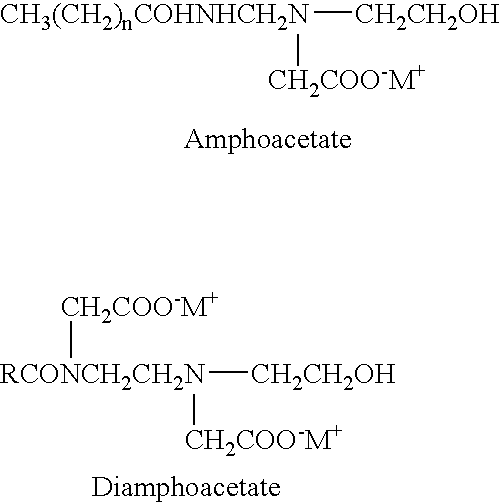 Amphoacetates and diamphoacetates conform to the formulas (above) where R is an aliphatic group of 8 to 18 carbon atoms. M is a cation such as sodium, potassium, ammonium, or substituted ammonium. Sodium lauroamphoacetate, sodium cocoamphoactetate, disodium lauroamphoacetate, and disodium cocodiamphoacetate are preferred in some embodiments. Additional surfactant from the classes of zwitterionic surfactant, and/or cationic surfactant, may be incorporated in the mild body wash compositions. In one embodiment, the mild body wash composition may further preferably comprise at least one zwitterionic surfactant. The mild body wash composition preferably comprises an zwitterionic surfactant at concentrations ranging from about 1% to about 50%, more preferably from about 2% to about 30%, even more preferably from about 3% to about 25%, by weight of the surfactant composition. Other zwitterionic surfactants suitable for use in the mild body wash compositions include betaines, including high alkyl betaines such as coco dimethyl carboxymethyl betaine, cocoamidopropyl betaine, cocobetaine, lauryl amidopropyl betaine, oleyl betaine, lauryl dimethyl carboxymethyl betaine, lauryl dimethyl alphacarboxyethyl betaine, cetyl dimethyl carboxymethyl betaine, lauryl bis-(2-hydroxyethyl)carboxymethyl betaine, stearyl bis-(2-hydroxypropyl)carboxymethyl betaine, oleyl dimethyl gamma-carboxypropyl betaine, and lauryl bis-(2-hydroxypropyl)alpha-carboxyethyl betaine. The sulfobetaines may be represented by coco dimethyl sulfopropyl betaine, stearyl dimethyl sulfopropyl betaine, lauryl dimethyl sulfoethyl betaine, lauryl bis-(2-hydroxyethyl)sulfopropyl betaine and the like; amidobetaines and amidosulfobetaines, wherein the RCONH(CH2)3 radical is attached to the nitrogen atom of the betaine are also useful in this invention. Cationic surfactants can also be used in the mild body wash compositions, but are generally less preferred, and preferably represent less than about 5% by weight of the compositions. The electrolyte, if used, can be added per se to the composition or it can be formed in situ via the counterions included in one of the raw materials. The electrolyte preferably includes an anion comprising phosphate, chloride, sulfate or citrate and a cation comprising sodium, ammonium, potassium, magnesium or mixtures thereof. Some preferred electrolytes are sodium or ammonium chloride or sodium or ammonium sulfate. A preferred electrolyte is sodium chloride. The electrolyte is preferably added to the surfactant component of the composition. The electrolyte, when present, should be present in an amount, which facilitates formation of the stable composition (Non-Newtonian shear thinning behavior). Generally, this amount is from about 0.1% by weight to about 15% by weight, preferably from about 1% to about 6% by weight of the composition, but may be varied if required. The mild body wash compositions of the present invention can comprise a benefit component. The benefit component is selected from the group consisting of lipids, hydrocarbons, fats, oils, hydrophobic plant extracts, fatty acids, essential oils, silicone materials and mixtures thereof; skin care actives, wherein the skin care actives are selected from the group consisting of vitamins and derivatives thereof; sunscreens; preservatives; anti-acne medicaments; antioxidants; skin soothing and healing; chelators and sequestrants; essential oils, skin sensates, and mixtures thereof. In one preferred embodiment the mild body wash compositions comprises benefit component comprising a hydrophobic compositions comprising a hydrophobic component. The mild body wash compositions comprises from about 20% to about 100%, preferably at least about 35%, even more preferably at least about 50% of a hydrophobic component. The hydrophobic compositions suitable for use in the present invention have a Vaughan Solubility Parameter, as described in copending application Ser. No. 60/542,710, filed on Feb. 6, 2004, of from about 5 to about 15. The hydrophobic compositions are preferably selected among those having defined rheological properties as described in copending application Ser. No. 60/542,710, filed on Feb. 6, 2004, including selected Consistency value (k) and Shear Index (n). These preferred rheological properties are especially useful in providing the mild body wash compositions with improved deposition of hydrophobic materials on the skin. In a preferred embodiment the mild, multi-phase body wash compositions having at least two visually distinct phases wherein at least one phase comprises a benefit phase comprising a hydrophobic composition comprising a hydrophobic component. The benefit phase in the preferred embodiment is preferably anhydrous. The hydrophobic compositions suitable for use in the preferred embodiment have a Vaughan Solubility Parameter, as described in copending application Ser. No. 60/542,710, filed on Feb. 6, 2004, of from about 5 to about 15. The hydrophobic compositions are preferably selected among those having defined rheological properties as described in copending application Ser. No. 60/542,710 filed on Feb. 6, 2004, including selected Consistency value (k) and Shear Index (n). These preferred rheological properties are especially useful in providing the multi-phased personal care compositions with improved deposition of hydrophobic materials on the skin. Nonlimiting examples of hydrophobic components suitable for use herein can include a variety of hydrocarbons, oils and waxes, silicones, fatty acid derivatives, cholesterol, cholesterol derivatives, diglycerides, triglycerides, vegetable oils, vegetable oil derivatives, acetoglyceride esters, alkyl esters, alkenyl esters, polyglycerin fatty acid esters, lanolin and its derivatives, wax esters, beeswax derivatives, sterols and phospholipids, vitamins and pro-vitamins and combinations thereof. Non-limiting examples of hydrocarbon oils and waxes suitable for use herein include petrolatum, mineral oil, micro-crystalline waxes, polyalkenes, paraffins, cerasin, ozokerite, polyethylene, perhydrosqualene, and combinations thereof. Non-limiting examples of silicone oils suitable for use as hydrophobic components herein include dimethicone copolyol, dimethylpolysiloxane, diethylpolysiloxane, mixed C1-C30 alkyl polysiloxanes, phenyl dimethicone, dimethiconol, and combinations thereof Preferred are non-volatile silicones selected from dimethicone, dimethiconol, mixed C1-C30 alkyl polysiloxane, and combinations thereof. Nonlimiting examples of silicone oils useful herein are described in U.S. Pat. No. 5,011,681 (Ciotti et al.). Non-limiting examples of diglycerides and triglycerides suitable for use as hydrophobic components herein include castor oil, soy bean oil, derivatized soybean oils such as maleated soy bean oil, safflower oil, cotton seed oil, corn oil, walnut oil, peanut oil, olive oil, cod liver oil, almond oil, avocado oil, palm oil and sesame oil, vegetable oils, sunflower seed oil, and vegetable oil derivatives; coconut oil and derivatized coconut oil, cottonseed oil and derivatized cottonseed oil, jojoba oil, cocoa butter, and combinations thereof. Non-limiting examples of acetoglyceride esters suitable for use as hydrophobic components herein include acetylated monoglycerides. Non-limiting examples of alkyl esters suitable for use as hydrophobic components herein include isopropyl esters of fatty acids and long chain esters of long chain (i.e. C10-C24) fatty acids, e.g. cetyl ricinoleate, non-limiting examples of which incloude isopropyl palmitate, isopropyl myristate, cetyl riconoleate and stearyl riconoleate. Other examples are: hexyl laurate, isohexyl laurate, myristyl myristate, isohexyl palmitate, decyl oleate, isodecyl oleate, hexadecyl stearate, decyl stearate, isopropyl isostearate, diisopropyl adipate, diisohexyl adipate, dihexyldecyl adipate, diisopropyl sebacate, acyl isononanoate lauryl lactate, myristyl lactate, cetyl lactate, and combinations thereof. Non-limiting examples of alkenyl esters suitable for use as hydrophobic components herein include oleyl myristate, oleyl stearate, oleyl oleate, and combinations thereof. Non-limiting examples of polyglycerin fatty acid esters suitable for use as hydrophobic components herein include decaglyceryl distearate, decaglyceryl diisostearate, decaglyceryl monomyriate, decaglyceryl monolaurate, hexaglyceryl monooleate, and combinations thereof. Non-limiting examples of lanolin and lanolin derivatives suitable for use as hydrophobic components herein include lanolin, lanolin oil, lanolin wax, lanolin alcohols, lanolin fatty acids, isopropyl lanolate, acetylated lanolin, acetylated lanolin alcohols, lanolin alcohol linoleate, lanolin alcohol riconoleate, and combinations thereof. Still other suitable hydrophobic components include milk triglycerides (e.g., hydroxylated milk glyceride) and polyol fatty acid polyesters. Still other suitable hydrophobic components include wax esters, non-limiting examples of which include beeswax and beeswax derivatives, spermaceti, myristyl myristate, stearyl stearate, and combinations thereof. Also useful are vegetable waxes such as carnauba and candelilla waxes; sterols such as cholesterol, cholesterol fatty acid esters; and phospholipids such as lecithin and derivatives, sphingo lipids, ceramides, glycosphingo lipids, and combinations thereof. In a preferred embodiment the mild body wash compositions can comprise a multi-phase composition having a benefit phase; wherein the benefit phase preferably can comprise one or more hydrophobic components, wherein at least 20% by weight of the hydrophobic components are selected from petrolatum, mineral oil, sunflower seed oil, micro-crystalline waxes, paraffins, ozokerite, polyethylene, polybutene, polydecene and perhydrosqualene dimethicones, cyclomethicones, alkyl siloxanes, polymethylsiloxanes and methylphenylpolysiloxanes, lanolin, lanolin oil, lanolin wax, lanolin alcohols, lanolin fatty acids, isopropyl lanolate, acetylated lanolin, acetylated lanolin alcohols, lanolin alcohol linoleate, lanolin alcohol riconoleate, castor oil, soy bean oil, maleated soy bean oil, safflower oil, cotton seed oil, corn oil, walnut oil, peanut oil, olive oil, cod liver oil, almond oil, avocado oil, palm oil and sesame oil, and combinations thereof. More preferably, at least about 50% by weight of the hydrophobic components are selected from the groups of petrolatum, mineral oil, paraffins, polyethylene, polybutene, polydecene, dimethicones, alkyl siloxanes, cyclomethicones, lanolin, lanolin oil, lanolin wax. The remainder of the hydrophobic component is preferably selected from: isopropyl palmitate, cetyl riconoleate, octyl isononanoate, octyl palmitate, isocetyl stearate, hydroxylated milk glyceride and combinations thereof. It has also been found that mild, multi-phased body wash compositions can be formulated with enhanced stability by density matching of the cleansing phase and the benefit phase and by incorporating density modifiers in the cleansing phase and/or the benefit phase. To further improve stability under stress conditions such as high temperature and vibration, it is preferable to adjust the densities of the separate phases such that they are substantially equal. To achieve this, low density microspheres are added to the cleansing phase of mild, multi-phased body wash composition. The low density microspheres employed to reduce the overall density of the cleansing phase are particles having a density lower than 0.7 g/cm3, preferably less than 0.2 g/cm3, more preferably less than 0.1 g/cm3, most preferably less than 0.05 g/cm3. The low density microspheres generally have a diameter less than 200 μm, preferably less than 100 μm, most preferably less than 40 μm. Preferably, the density difference between the cleansing phase and the benefit phase is less than 0.15 g/cm3, more preferably, the density difference is less than 0.10 g/cm3, even more preferably, the density difference is less than 0.05 g/cm3, most preferably, the density difference is less than 0.01 g/cm3. The microspheres are produced from any appropriate inorganic or organic material, compatible with a use on the skin, that is, nonirritating and nontoxic. Preferably, the microspheres don't negatively impact the product lather performance. Expanded microspheres made of thermoplastic material are known, and may be obtained, for example, according to the processes described in Patents and Patent Applications EP-56219, EP-348372, EP-486080, EP-320473, EP-112807 and U.S. Pat. No. 3,615,972. These microspheres may be produced from any nontoxic and non-irritant thermoplastic materials. Polymers or copolymers of acrylonitrile or of vinylidene chloride may be used, for example. It is possible to use, for example, a copolymer containing, by weight, from 0 to 60% of units derived from vinylidene chloride, from 20 to 90% of units derived from acrylonitrile and from 0 to 50% of units derived from an acrylic or styrene monomer, the sum of the percentages (by weight) being equal to 100. The acrylic monomer is, for example, a methyl or ethyl acrylate or methacrylate. The styrene monomer is, for example, alpha-methylstyrene or styrene. These microspheres can be in the dry or hydrated state. The internal cavity of expanded hollow microspheres contains a gas, which can be a hydrocarbon such as isobutane or isopentane or alternatively air. Among hollow microspheres which can be used, special mention may be made of those marketed under the brand name EXPANCEL® (thermoplastic expandable microspheres) by the Akzo Nobel Company, especially those of DE (dry state) or WE (hydrated state) grade. Examples include: Expancel® 091 DE 40 d30; Expancel® 091 DE 80 d30; Expancel® 051 DE 40 d60; Expancel® 091 WE 40 d24; Expancel® 053 DE 40 d20. Representative microspheres derived from an inorganic material, include, for instance, “Qcel® Hollow Microspheres” and “EXTENDOSPHERES™ Ceramic Hollow Spheres”, both available from the PQ Corporation. Examples are: Qcel® 300; Qcel® 6019; Qcel® 6042S. Just as low density microspheres can be added to the cleansing phase of the present invention to improve vibrational stability, high density materials can be added to the benefit phase to increase its density having the same impact on stability. Just as low density microspheres can be added to the cleansing phase of the present invention to improve stability, high density materials can be added to the benefit phase to increase its density having the same impact on stability. The high density particles employed to increase the overall density of the benefit phase are particles having a density greater than 1.1 g/cm3, preferably greater than 1.5 g/cm3, more preferably greater than 2.0 g/cm3, most preferably greater than 2.5 g/cm3. The high density particles generally have a diameter less than 200 μm, preferably less than 100 μm, most preferably less than 40 μm. Preferably, the high density particles are selected from water-insoluble inorganic materials, metals, metal oxides, metal alloys and mixture thereof. Non-limiting examples include calcium carbonate, silica, clays, mica, talc, iron, zinc, copper, lead, titanium dioxide, zinc oxide, and the like. A variety of suitable optional benefit component can be employed in the mild body wash composition. Such benefit components are most typically those components approved for use in cosmetics and that are described in reference books such as the CTFA Cosmetic Ingredient Handbook, Second Edition, The Cosmetic, Toiletries, and Fragrance Association, Inc. 1988, 1992. These optional benefit components can be used in any aspect of the compositions of the present invention, including each phase as described herein. Non-limiting optional benefit components include humectants and solutes. A variety of humectants and solutes can be employed and can be present at a level of from about 0.1% to about 50%, preferably from about 0.5% to about 35%, and more preferably from about 2% to about 20%, by weight of the personal care composition. A preferred humectant is glycerin. where R1=H, C1-C4 alkyl; R2=H, CH3 and n=1-200; C2-C10 alkane diols; guanidine; glycolic acid and glycolate salts (e.g. ammonium and quaternary alkyl ammonium); lactic acid and lactate salts (e.g. ammonium and quaternary alkyl ammonium); polyhydroxy alcohols such as sorbitol, glycerol, hexanetriol, propylene glycol, hexylene glycol and the like; polyethylene glycol; sugars and starches; sugar and starch derivatives (e.g. alkoxylated glucose); panthenol (including D-, L-, and the D,L-forms); pyrrolidone carboxylic acid; hyaluronic acid; lactamide monoethanolamine; acetamide monoethanolamine; urea; and ethanol amines of the general structure (HOCH2CH2)xNHy where x=1-3; y=0-2, and x+y=3, and mixtures thereof. The most preferred polyols are selected from the group consisting of glycerine, polyoxypropylene(1) glycerol and polyoxypropylene(3) glycerol, sorbitol, butylene glycol, propylene glycol, sucrose, urea and triethanol amine. Nonionic polyethylene/polypropylene glycol polymers are preferably used as skin conditioning agents. Polymers useful herein that are especially preferred are PEG-2M wherein x equals 2 and n has an average value of about 2,000 (PEG 2-M is also known as Polyox WSR® N-10 from Union Carbide and as PEG-2,000); PEG-5M wherein x equals 2 and n has an average value of about 5,000 (PEG 5-M is also known as Polyox WSR® 35 and Polyox WSR® N-80, both from Union Carbide and as PEG-5,000 and Polyethylene Glycol 200,000); PEG-7M wherein x equals 2 and n has an average value of about 7,000 (PEG 7-M is also known as Polyox WSR® (N-750 from Union Carbide); PEG-9M wherein x equals 2 and n has an average value of about 9,000 (PEG 9-M is also known as Polyox WSR® N-3333 from Union Carbide); PEG-14 M wherein x equals 2 and n has an average value of about 14,000 (PEG 14-M is also known as Polyox WSR-205 and Polyox WSR® N-3000 both from Union Carbide); and PEG-90M wherein x equals 2 and n has an average value of about 90,000. (PEG-90M is also known as Polyox WSR®-301 from Union Carbide.) Other non limiting examples of these optional benefit components include vitamins and derivatives thereof (e.g., ascorbic acid, vitamin E, tocopheryl acetate, and the like); sunscreens; thickening agents (e.g., polyol alkoxy ester, available as Crothix from Croda); preservatives for maintaining the anti microbial integrity of the cleansing compositions; anti-acne medicaments (resorcinol, salicylic acid, and the like); antioxidants; skin soothing and healing agents such as aloe vera extract, allantoin and the like; chelators and sequestrants; and agents suitable for aesthetic purposes such as fragrances, essential oils, skin sensates, pigments, pearlescent agents (e.g., mica and titanium dioxide), lakes, colorings, and the like (e.g., clove oil, menthol, camphor, eucalyptus oil, and eugenol). In a preferred embodiment the mild body wash composition comprises at least about 0.5%, by weight of said composition, of a fragrance. The mild body wash composition can comprise a particle. In a preferred embodiment, the mild, multi-phase body wash composition that can comprise a particle in at least one phase. Water insoluble solid particle of various shapes and densities is useful. In a preferred embodiment, the particle tends to have a spherical, an oval, an irregular, or any other shape in which the ratio of the largest dimension to the smallest dimension (defined as the Aspect Ratio) is less than about 10. More preferably, the Aspect Ratio of the particle is less than about 8, still more preferably the Aspect Ratio of the particle is less than about 5. The particle of the present invention has a particle size (volume average based on the particle size measurement described in copending application Ser. No. 60/542,710 filed on Feb. 6, 2004) of less than about 100 μm, preferably less than about 80 μm, and more preferably the particle size of less than about 60 μm. The particle of the present invention preferably has a particle size of greater than about 0.1 μm, preferably a particle size of greater than about 0.5 μm, more preferably, a particle size greater than about 1 μm, still more preferably a particle size greater than about 2 μm, even more preferably a particle size greater than about 3 μm, and still even more preferably a particle size greater than about 4 μm. The particle has a diameter from about 1 μm to about 70 μm, more preferably from about 2 μm to about 65 μm, and even more preferably from about 2 μm to about 60 μm in diameter. The mild body wash composition of the present invention comprises the particle at a cosmetically efficacious level. Preferably, the particles are present from at least about 0.1% by weight of the composition, more preferably at least about 0.2% by weight of composition, even more preferably at least about 0.5%, still more preferably at least about 1%, and even still more preferably at least 2% by weight of composition. In the mild body wash composition of the present invention, preferably the particles comprises no more than about 50% by weight of composition, more preferably no more than about 30%, still more preferably no more than about 20%, and even more preferably no more than about 10% by weight of composition. Preferably, the particle will also have physical properties which are not significantly affected by typical processing of the composition. Preferably, a particle having a melting point greater than about 70° C. is used, more preferably having a melting point greater than about 80° C., and even more preferably having a melting point of greater than about 95° C. is used. As used herein, melting point would refer to the temperature at which the particle transitions to a liquid or fluid state or undergoes significant deformation or physical property changes. In addition, many of the particles of present invention are cross-linked or have a cross-linked surface membrane. These particles do not exhibit a distinct melting point. Cross-linked particles are also useful as long as they are stable under the processing and storage conditions used in the making of compositions. The particles that can be present in the present invention can be natural, synthetic, or semi-synthetic. In addition, hybrid particles can also be present. Synthetic particles can made of either cross-linked or non cross-linked polymers. The particles of the present invention can have surface charges or their surface can be modified with organic or inorganic materials such as surfactants, polymers, and inorganic materials. Particle complexes can be present. Non limiting examples of natural particles include various precipitated silica particles in hydrophilic and hydrophobic forms available from Degussa-Huls under the trade name Sipernet. Precipitated™, hydrophobic, synthetic amorphous silica, available from Degussa under the trade name Sipernet D11™ is a preferred particle. Snowtex colloidal silica particles available from Nissan Chemical America Corporation. Nonlimiting examples of synthetic particles include nylon, silicone resins, poly(meth)acrylates, polyethylene, polyester, polypropylene, polystyrene, polyurethane, polyamide, epoxy resins, urea resins, and acrylic powders. Non limiting examples of useful particles are Microease 110S, 114S, 116 (micronized synthetic waxes), Micropoly 210, 250S (micronized polyethylene), Microslip (micronized polytetrafluoroethylene), and Microsilk (combination of polyethylene and polytetrafluoroethylene), all of which are available from Micro Powder, Inc. Additional examples include Luna (smooth silica particles) particles available from Phenomenex, MP-2200 (polymethylmethacrylate), EA-209 (ethylene/acrylate copolymer), SP-501(nylon-12), ES-830 (polymethly methacrylate), BPD-800, BPD-500 (polyurethane) particles available from Kobo Products, Inc. and silicone resins sold under the name Tospearl particles by GE Silicones. Ganzpearl GS-0605 crosslinked polystyrene (available from Presperse) is also useful. The exfoliant particle is selected from the group consisting of polyethylene, microcrystalline wax, jojoba esters, amorphous silica, talc, tracalcium orthophosphate, or blends thereof, and the like. The exfoliant particle has a particle size dimension along the major axis of the particle of from about 100 microns to about 600 microns, preferably from about 100 microns to about 300 microns. The exfoliant particle has a hardness of less than about 4 Mohs, preferably less than about 3 Mohs. The hardness as so measured is a criterion of the resistance of a particular material to crushing. It is known as being a fairly good indication of the abrasive character of a particulate ingredient. Examples of materials arranged in increasing order of hardness according to the Moh scale are as follows: h(hardness)-1:talc; h-2: gypsum, rock salt, crystalline salt in general, barytes, chalk, brimstone; h-4: fluorite, soft phosphate, magnesite, limestone; h-5: apatite, hard phosphate, hard limestone, chromite, bauxite; h-6: feldspar, ilmenite, hornblendes; h-7: quartz, granite; h-8: topaz; h-9: corrundum, emery; and h-10: diamond. Preferably, the exfoliant particle has a color distinct from the cleansing base. The exfoliant particle is preferably present at a level of less than about 10%, preferably less than about 5%, by wt of the composition. The mild body wash composition can comprise a shiny particle. In a preferred embodiment, the mild, multi-phase body wash composition can comprise a shiny particle in at least one phase. Nonlimiting examples of shiny particles include the following: interference pigment, multi-layered pigment, metallic particle, solid and liquid crystals, or combinations thereof. An interference pigment is a pigment with pearl gloss prepared by coating the surface of a particle substrate material with a thin film. The particle substrate material is generally platelet in shape. The thin film is a transparent or semitransparent material having a high refractive index. The high refractive index material shows a pearl gloss resulting from mutual interfering action between reflection and incident light from the platelet substrate/coating layer interface and reflection of incident light from the surface of the coating layer. The interference pigments of the mild body wash composition preferably comprises no more than about 20 weight percent of the composition, more preferably no more than about 10 weight percent, even more preferably no more than about 7 weight percent, and still more preferably no more than about 5 weight percent of the mild body wash composition. The interference pigment of the mild body wash composition preferably comprises at least about 0.1 weight percent of the mild body wash composition, more preferably at least about 0.2 weight percent, even more preferably at least about 0.5 weight percent, and still more preferably at least about 1 weight percent by weight of the composition. When pigment is applied and rinsed as described in the Pigment Deposition Tape Strip Method as described in copending application Ser. No. 60/469,075 filed on May 8, 2003, the deposited pigment on the skin is preferably at least 0.5 μg/cm2, more preferably at least 1 μg/cm2, and even more preferably at least 5 μg/cm2. The interference pigments of the present invention are platelet particulates. The platelet particulates preferably have a thickness of no more than about 5 μm, more preferably no more than about 2 μm, still more preferably no more than about 1 μm. The platelet particulates of the preferably have a thickness of at least about 0.02 μm, more preferably at least about 0.05 μm, even more preferably at least about 0.1 μm, and still more preferably at least about 0.2 μm. The particle size determines the opacity and luster. The particle size is determined by measuring the diameter thickness of the particulate material. The term “diameter” as used herein, means the largest distance across the major axis of the particulate material. Diameter can be determined by any suitable method known in the art, such as particle size analyzer Mastersizer 2000 manufactured by Malvern Instruments. The interference pigment preferably have an average diameter not greater than about 200 μm, more preferably not greater than 100 μm, even more preferably not greater than about 80 μm, still more preferably not greater than than about 60 μm. The interference pigment preferably have a diameter of at least about 0.1 μm, more preferably at least about 1.0 μm, even more preferably at least about 2.0 μm, and still more preferably at least about 5.0 μm. The interference pigment can comprise a multilayer structure. The centre of the particulates is a flat substrate with a refractive index (RI) normally below 1.8. A wide variety of particle substrates are useful herein. Nonlimiting examples are natural mica, synthetic mica, graphite, talc, kaolin, alumina flake, bismuth oxychloride, silica flake, glass flake, ceramics, titanium dioxide, CaSO4, CaCO3, BaSO4, borosilicate and mixtures thereof, preferably mica, silica and alumina flakes. A layer of thin film or a multiple layer of thin films are coated on the surface of a substrate described above. The thin films are made of highly refractive materials. The refractive index of these materials is normally above 1.8. A wide variety of thin films are useful herein. Nonlimiting examples are TiO2, Fe2O3, SnO2, Cr2O3, ZnO, ZnS, ZnO, SnO, ZrO2, CaF2, Al2O3, BiOCl, and mixtures thereof or in the form of separate layers, preferably TiO2, Fe2O3, Cr2O3 SnO2. For the multiple layer structures, the thin films can be consisted of all high refractive index materials or alternation of thin films with high and low RI materials with the high RI film as the top layer. The interference color is a function of the thickness of thin film, the thickness for a specific color may be different for different materials. For TiO2, a layer of 40 nm to 60 nm or a whole number multiple thereof gives silver color, 60 nm to 80 nm yellow color, 80 nm to 100 nm red color, 100 nm to 130 nm blue color, 130 nm to 160 nm green color. In addition to the interference color, other transparent absorption pigments can be precipitated on top of or simultaneously with the TiO2 layer. Common materials are red or black iron oxide, ferric ferrocyanide, chromium oxide or carmine. It was found that the color of the interference pigment in addition to its brightness had a significant influence on human perception of skin tone. In general, preferred colors are silver, gold, red, green and mixtures thereof. Nonlimiting examples of the interference pigments useful herein include those supplied by Persperse, Inc. under the trade name PRESTIGE®, FLONAC®; supplied by EMD Chemicals, Inc. under the trade name TIMIRON®, COLORONA®, DICHRONA® and XIRONA®; and supplied by Engelhard Co. under the trade name FLAMENCO®, TIMICA®, DUOCHROME®. In an embodiment of the present invention the interference pigment surface is either hydrophobic or has been hydrophobically modified. The Particle Contact Angle Test as described in copending application Ser. No. 60/469,075 filed on May 8, 2003 is used to determine contact angle of interference pigments. The greater the contact angle, the greater the hydrophobicity of the interference pigment. The interference pigment of the present invention possess a contact angle of at least 60°, more preferably greater than 80°, even more preferably greater than 1000, still more preferably greater than 100°. The hydrophobically modified interference pigment or HMIP allows for the entrapment of the HMIP within the phases and greater deposition of the HMIP. Preferably the ratio of HMIP to a phase is 1:1 to about 1:70, more preferably 1:2 to about 1:50, still more preferably 1:3 to about 1:40 and most preferably 1:7 to about 1:35. In an embodiment of the present invention the HMIP's are preferably entrapped within the hydrophobic composition. This necessitates that the hydrophobic composition particle size is generally larger than the HMIP. In a preferred embodiment of the invention, the hydrophobic composition particles contain only a small number of HMIPs per hydrophobic composition particles. Preferably this is less than 20, more preferably less than 10, most preferably less than 5. These parameters, the relative size of the benefit droplets to the HMIP and the approximate number of HMIP particles per hydrophobic composition particles, can be determined by using visual inspection with light microscopy. The HMIP and the hydrophobic composition can be mixed into the composition via a premix or separately. For the case of separate addition, the hydrophobic pigments partition into the hydrophobic composition during the processing of the formulation. The HMIP of the present invention preferably has a hydrophobic coating comprising no more than about 20 weight percent of the total particle weight, more preferably no more than about 15 weight percent, even more preferably no more than about 10 weight percent. The HMIP of the present invention preferably has a hydrophobic coating comprising at least about 0.1 weight percent of the total particle weight, more preferably at least about 0.5 weight percent, even more preferably at least about 1 weight percent. Nonlimiting examples of the hydrophobic surface treatment useful herein include silicones, acrylate silicone copolymers, acrylate polymers, alkyl silane, isopropyl titanium triisostearate, sodium stearate, magnesium myristate, perfluoroalcohol phosphate, perfluoropolymethyl isopropyl ether, lecithin, carnauba wax, polyethylene, chitosan, lauroyl lysine, plant lipid extracts and mixtures thereof, preferably, silicones, silanes and stearates. Surface treatment houses include US Cosmetics, KOBO Products Inc., and Cardre Inc. In a preferred embodiment the mild, multi-phase body wash compositions can comprise at least two visually distinct phases wherein at least one phase comprises a non-lathering structured aqueous phase. The non-lathering structured aqueous phase of the composition comprises a water structurant and water. The non-lathering structured aqueous phase can be hydrophilic and in a preferred embodiment the non-lathering structured aqueous phase is a hydrophilic gelled water phase. In addition, the non-lathering structured aqueous phase typically comprises less than about 5%, preferably less than about 3%, and more preferably less than about 1%, by weight of the non-lathering structured aqueous phase, of a surfactant. In one embodiment of the present invention, the non-lathering structured aqueous phase is free of surfactant. The non-lathering structured aqueous phase has a preferred rheology profile as defined by Consistency Value (k) and Shear Index (n). Preferred Consistency Values of the non-lathering structured aqueous phase are from about 10 to about 100,000 poise/(1/s), preferably from about 10 to about 10,000 poise/(1/s), and more preferably from about 100 to about 1,000 poise/(1/s). The Shear Index of the non-lathering structured aqueous phase typically ranges from about 0.1 to about 0.8, preferably from about 0.1 to about 0.5, and more preferably from about 0.20 to about 0.4. The Shear Index (n) and Consistency Value (k) are well-known and accepted industry standards for reporting the viscosity profile of compositions having a viscosity that is a function of an applied shear rate. The methodology used to obtain these values was described in greater detail in copending application Ser. No. 60/542,710 filed on Feb. 6, 2004. The non-lathering structured aqueous phase of the present invention comprises from about 30% to about 99%, by weight of the non-lathering structured aqueous phase, of water. The non-lathering structured aqueous phase generally comprises more than about 50%, preferably more than about 60%, even more preferably more than about 70%, still more preferably more than about 80%, by weight of the non-lathering structured aqueous phase, of water. The non-lathering structured aqueous phase will typically have a pH of from about 5 to about 8, more preferably about 7. The non-lathering structured aqueous phase can optionally comprise a pH regulator to facilitate the proper pH range. The non-lathering structured aqueous phase can have a net cationic charge, net anionic charge, or neutral charge. In a preferred embodiment, the non-lathering structured aqueous phase has a net anionic charge. The non-lathering structured aqueous phase of the present compositions can further comprise optional ingredients such as those described hereinafter. Preferred optional ingredients for the non-lathering structured aqueous phase include pigments, pH regulators, and preservatives. In one embodiment, the non-lathering structured aqueous phase comprises a water structurant (e.g. acrylates/vinyl isodecanoate crosspolymer), water, a pH regulator (e.g. triethanolamine), and a preservative (e.g. 1,3-dimethylol-5,5-dimethylhydantoin (“DMDMH” available from Lonza under the trade name GLYDANT®)). The non-lathering structured aqueous phase comprises from about 0.1% to about 30%, preferably from about 0.5% to about 20%, more preferably from about 0.5% to about 10%, and even more preferably from about 0.5% to about 5%, by weight of the non-lathering structured aqueous phase, of a water structurant. The water structurant is typically selected from the group consisting of inorganic water structurants, charged polymeric water structurants, water soluble polymeric structurants, associative water structurants, and mixtures thereof. Non-limiting examples of inorganic water structurants for use in the mild body wash composition include silicas, clays such as a synthetic silicates (Laponite XLG and Laponite XLS from Southern Clay), or mixtures thereof. Non-limiting examples of charged polymeric water structurants for use in the mild body wash composition include AcrylatesNinyl Isodecanoate Crosspolymer (Stabylen 30 from 3V), Acrylates/C10-30 Alkyl Acrylate Crosspolymer (Pemulen TR1 and TR2), Carbomers, Ammonium Acryloyldimethyltaurate/VP Copolymer (Aristoflex AVC from Clariant), Ammonium Acryloyldimethyltaurate/Beheneth-25 Methacrylate Crosspolymer (Aristoflex HMB from Clariant), Acrylates/Ceteth-20 Itaconate Copolymer (Structure 3001 from National Starch), Polyacrylamide (Sepigel 305 from SEPPIC), or mixtures thereof. Non-limiting examples of water soluble polymeric structurants for use in the mild body wash composition include cellulosic gel, hydroxypropyl starch phosphate (Structured XL from National Starch), polyvinyl alcohol, or mixtures thereof. Nonlimiting examples of associative water structurants for use in the the mild body wash composition include xanthum gum, gellum gum, pectin, alginate, or mixtures thereof. The Ultracentrifugation Method is used to determine the percent of a structured domain or an opaque structured domain that is present in a mild body wash composition that comprises a surfactant component. The method involves the separation of the composition through ultracentrifugation into separate but distinguishable layers. The mild body wash composition of the present invention can have multiple distinguishable layers, for example a non-structured surfactant layer, a structured surfactant layer, and a benefit component layer. First, dispense about 4 grams of body wash product into Beckman Centrifuge Tube (11×60 mm). Next, place the centrifuge tubes in an Ultracentrifuge (Beckman Model L8-M or equivalent) and set ultracentrifuge to the following conditions: 50,000 rpm, 18 hours, and 25° C.
The structured surfactant layer components may comprise several layers or a single layer. Upon ultracentrifugation, there is generally an isotropic layer at the bottom or next to the bottom of the ultracentrifuge tube. This clear isotropic layer typically represents the non-structured micellar surfactant layer. The layers above the isotropic layer generally comprise higher surfactant concentration with higher ordered structures (such as liquid crystals). These structured layers are sometimes opaque to naked eyes, or translucent, or clear. There is generally a distinct phase boundary between the structured layer and the non-structured isotropic layer. The physical nature of the structured surfactant layers can be determined through microscopy under polarized light. The structured surfactant layers typically exhibit distinctive texture under polarized light. Another method for characterizing the structured surfactant layer is to use X-ray diffraction technique. The Structured surfactant layer displays multiple lines that are often associated primarily with the long spacings of the liquid crystal structure. If there is no benefit component layer present, use the total height as the surfactant layer height, Hs=Ha. A TA Instruments AR2000 Controlled Stress Rheometer can be used to determine the Yield Point of the surfactant component. For purpose herein, the Yield Point of the surfactant component or the mild body wash composition is the amount of stress required to produce the onset of flow, where a significant increase in strain rate occurs. The determination is performed at 25° C. with a 4 cm diameter parallel plate measuring system and a 1 mm gap. The determination is performed via the programmed application of a shear stress continuous ramp (typically from about 0.1 Pa to about 500 Pa) over a time interval of 5 minutes, collecting 30 data points per decade of stress in an evenly spaced logarithmic stress progression. Stress results in a deformation of the sample, and a shear stress vs. strain curve can be created. The shear stress (Pa) is graphed on the x-axis vs. the strain on the y-axis using logarithmic scales for both axes. The mild body wash composition and surfactant component which are structured exhibit an initial region at low stresses that appears as a straight line when plotted in this way. The Yield Point is the stress point at which the observed strain deviates by greater than 10% from a regression line (i.e. from the predicted strain) extended from the initial straight line region on the log-log plot, determined by linear regression of log-log transformed stress-strain data points between 0.2-2.0 Pa, and continues to deviate by a substantially increasing and accelerating amount with each subsequent point, such that flow occurs. The surfactant component is measured either prior to combining in the composition, or after combining in the composition by separating the compositions by suitable non-destructive physical separation means. The metal pycnomoeter is utilized for determination of density (specific gravity) of both the cleansing phase and the benefit phase compositions. One suggested type of metal pycnometer can be obtained from Fisher, 3-347. Other equivalent pycnometer can also be used. Following procedure are the steps for measuring density (specific gravity) of the cleansing phase and the benefit phase compositions. The metal pycnometer must be clean and dry before use. Diassemble the metal pycnometer completely and wash all parts well with water. Follow the water rinse with an alcohol rinse. Expel the alcohol with a stream of dry, clean air. Fill the clean, dry pycnometer with distilled water at 25 C. Place the lid on body of pycnometer and screw the cap firmly in place. Dry the outside of pycnometer well with a tissue and weigh to 0.001g. Clean and dry the pycnometer according to the directions shown above. Assemble and weigh the dry pycnometer to 0.001 g.
Clean and dry the pycnometer according to the directions shown above. Allow the sample to equilibrate to room temperature. Pour the sample into the pycnometer, taking care to avoid introducing air into the sample in the pycnometer. Add an excess of sample so that it extends slightly above the top of the threads. Place the lid inside the cap and screw the cap firmly onto the body of the pycnometer. Any excess sample will be forced through the hole in the lid of the pycnometer. Wipe away the excess sample carefully with a tissue. Weight the filled pycnometer to 0.001 g.
Sample Weight=Weight of pycnometer and sample−weight of pycnometer. The density difference between the cleansing phase and the benefit phase is less than 0.15 g/cm3, preferably, the density difference is less than 0.10 g/cm3, more preferably, the density difference is less than 0.05g/cm3, most preferably, the density difference is less than 0.01 g/cm3. The mild body wash compositions of the present invention are preferably applied topically to the desired area of the skin or hair in an amount sufficient to provide effective delivery of the skin cleansing agent, hydrophobic component, and particles to the applied surface. The compositions can be applied directly to the skin or indirectly via the use of a cleansing puff, washcloth, sponge or other implement. The compositions are preferably diluted with water prior to, during, or after topical application, and then subsequently the skin or hair rinsed or wiped off, preferably rinsed off of the applied surface using water or a water-insoluble substrate in combination with water. The present invention is therefore also directed to methods of cleansing the skin through the above-described application of the compositions of the present invention. The methods of the present invention are also directed to a method of providing effective delivery of the desired skin active agent, and the resulting benefits from such effective delivery as described herein, to the applied surface through the above-described application of the compositions of the present invention. The mild body wash composition of the present invention may be prepared by any known or otherwise effective technique, suitable for making and formulating the desired product form. Specific non-limiting examples of such methods as they are applied to specific embodiments of the present invention are described in the following examples. In a preferred embodiment of the present invention the mild, multi-phase body wash composition may be prepared by any known or otherwise effective technique, suitable for making and formulating the desired multi-phase product form. It is effective to combine toothpaste-tube filling technology with a spinning stage design. Additionally, the present invention can be prepared by the method and apparatus as disclosed in U.S. Pat. No. 6,213,166. The method and apparatus allows two or more compositions to be filled with a spiral configuration into a single container. The method requires that at least two nozzles be employed to fill the container. The container is placed on a static mixer and spun as the composition is introduced into the container. Alternatively, it is effective to combine at least two phases by first placing the separate compositions in separate storage tanks having a pump and a hose attached. The phases are then pumped in predetermined amounts into a single combining section. Next, the phases are moved from the combining sections into the blending sections and the phases are mixed in the blending section such that the single resulting product exhibits a distinct pattern of the phases. The pattern is selected from the group consisting of striped, marbled, geometric, and mixtures thereof. The next step involves pumping the product that was mixed in the blending section via a hose into a single nozzle, then placing the nozzle into a container and filing the container with the resulting product. Specific non-limiting examples of such methods as they are applied to specific embodiments of the present invention are described in the following examples. If the mild body wash composition comprises multi-phase personal care compositions comprising patterns of varying colors it can be desirable to package these compositions in a transparent or translucent package such that the consumer can view the pattern through the package. Because of the viscosity of the subject compositions it may also be desirable to include instructions to the consumer to store the package upside down, on its cap to facilitate dispensing. All parts, ratios, and percentages herein, in the Specification, Examples, and Claims, are by weight and all numerical limits are used with the normal degree of accuracy afforded by the art, unless otherwise specified. The following examples described are non-limiting examples of mild body wash compositions. The compositions described above can be prepared by conventional formulation and mixing techniques. Combine the following ingredients water distilled, guar hydroxypropyltrimonium chloride, citric acid, anhydrous USP, and glycerin. Heat the mixture to 65-70° C. while agitating the mixture. Keep agitation until a homogenous solution forms. When homogenous, maintain 65-70° C. and add the following ingredients: PEG 90M. Hampene NA2 (Dissolvine NA-2X), sodium trideceth sulfate, sodium lauroamphoacetate, steareth-2. Next, add petrolatum and mix until homogenous. When homogenous, add sodium chloride and mix until homogenous. Adjust the pH to 5.8-6.2 using citric acid. Finally, cool the mixture to 48° C. and add the following ingredients: perfume and DMDM Hydantoin. The following examples described are non-limiting examples of a mild, multi-phase body wash composition. The compositions described above can be prepared by conventional formulation and mixing techniques. Prepare the first phase composition by first adding citric acid into water at 1:3 ratio to form a citric acid premix. Then, add the following ingredients into the main mixing vessel in the following sequence: water, sodium trideceth sulfate, sodium lauroamphoacetate, Steareth-2, sodium chloride, sodium benzoate, Disodium EDTA, glydant. Heat to 65-70° C. Start agitation of the main mixing vessel. In a separate mixing vessel, disperse polymers (Polyquaterium 10, Jaguar C-17, or N-Hance 3196) in water at 1:10 ratio and form a polymer premix. Add the completely dispersed polymer premix into the main mixing vessel with continuous agitation. Disperse Polyox WSR 301 in water and then add to the main mixing vessel. Then, add the rest of the water. Cool to 48° C. and add perfume into the batch. Keep agitation until a homogenous solution forms. The second phase can be prepared by adding petrolatum into a mixing vessel. Heat the vessel to 190° F. (88° C.). Then, add mineral oil and particles. High shear the batch to ensure good particle dispersion. Keep agitating the batch and slowly cool down the batch to ambient temperature. These phases can be combined by first placing the separate phases in separate storage tanks having a pump and a hose attached. The phases are then pumped in predetermined amounts into a single combining section. Next, the phases are moved from the combining sections into the blending sections and the phases are mixed in the blending section such that the single resulting product exhibits a distinct pattern of the phases. The pattern is selected from the group consisting of striped, marbled, geometric, and mixtures thereof. The next step involves pumping the product that was mixed in the blending section via a hose into a single nozzle, then placing the nozzle into a container and filing the container with the resulting product. The products remain stable at ambient for at least 180 days. The following examples described are non-limiting examples of a mild, multi-phase body wash composition and particulate. The second phase can be prepared similarly by conventional formulation and mixing techniques. Prepare by first adding citric acid into water at 1:3 ratio to form a citric acid premix. Then, add the following ingredients into the main mixing vessel in the following sequence: water, sodium trideceth sulfate, sodium lauroamphoacetate, Laureth-2, sodium chloride, sodium benzoate, Disodium EDTA, glydant. Heat to 65-70° C. Start agitation of the main mixing vessel. In a separate mixing vessel, disperse polymers (Polyquaterium 10, Jaguar C-17, or N-Hance 3196) in water at 1:10 ratio and form a polymer premix. Add the completely dispersed polymer premix into the main mixing vessel with continuous agitation. Disperse Polyox WSR 301 in water and then add to the main mixing vessel. Then, add the rest of the water. Cool to 48° C. and add perfume into the batch. Finally, add the particulate matter and keep agitation until a homogenous solution forms. The compositions described above can be prepared by conventional formulation and mixing techniques. Prepare the first phase composition by first adding citric acid into water and adding the cationic polymer, mixing to dissolve. Add the Expancel with only slight agitation to minimize foaming. Then, add the surfactants and stir until homogeneous and free flowing. Add the sodium chloride and stir until the composition thickens and is homogeneous. In a separate vessel, prepare a premix of the xanthan gum and perfume, which will have a paste-like consistency. While agitating the composition in the mix vessel, add the premix within one minute of its completion and stir vigorously to disperse the polymer completely until no lumps are evident. Add all remaining ingredients and mix until homogeneous. Adjust pH to between 6.1-6.5.
wherein said composition comprises a structured domain. 2. The mild body wash composition of claim 1, further comprising an amphoteric surfactant, a zwitterionic surfactant and mixtures thereof. 3. The mild body wash composition of claim 1, comprising from about 1% to about 95%, by weight of the composition, of said surfactant component. 4. The mild body wash composition of claim 1, comprising from about 5% to about 95%, by weight of the composition, of a surfactant component. 5. The mild body wash composition of claim 1, wherein said anionic surfactant is selected from the group consisting of alkyl ether sulfates, alkyl sulfonates and mixtures thereof. 6. The mild body wash composition of claim 1, wherein said amphoteric surfactant is selected from the group consisting of sodium lauroamphoacetate, sodium cocoamphoactetate, disodium lauroamphoacetate disodium cocodiamphoacetate, and mixtures thereof. 7. The mild body wash composition of claim 1, wherein said nonionic surfactant is selected from the group consisting of glyceryl monohydroxystearate, steareth-2, propylene glycol stearate, PEG-2 stearate, sorbitan monostearate, glyceryl stearate, laureth-2, and mixtures thereof. 8. The mild body wash composition of claim 1, wherein said electrolyte is selected from the group consisting of sodium chloride, ammonium chloride, sodium sulfate, ammonium sulfate, and mixtures thereof. 9. The mild body wash composition of claim 1, wherein said structured domain is an opaque structured domain. 10. The mild body wash composition of claim 9, wherein said opaque structured domain is a lamellar phase. 11. The mild body wash composition of claim 1, further comprising at least about 0.5%, by weight of said composition, of a fragrance. 12. The mild body wash composition of claim 1, wherein said composition is substantially free of a polysiloxane. 13. The mild body wash composition of claim 1, wherein said composition is substantially free of alkyl amines and alkanolamide. 14. The mild body wash composition of claim 1, wherein said nonionic surfactant has an HLB of from about 3.4 to 13.0. 15. The mild body wash composition of claim 14, wherein said nonionic surfactant has an HLB of from about 3.4 to about 9.5.
preservatives; anti-acne medicaments; antioxidants; chelators; essential oils, skin sensates, and particles selected from the group consisting of natural, synthetic, semi-synthetic, hybrid and combinations thereof. wherein said visually distinct phases are packaged in physical contact with one another and maintain stability. 18. The mild, multi-phased body wash composition of claim 17, further comprising an amphoteric surfactant, a zwitterionic surfactant and mixtures thereof. 19. The mild, multi-phased body wash composition of claim 17, wherein said visually distinct phases are selected from the group consisting of a cleansing phase, a benefit phase, a non-lathering structured aqueous phase, and combinations thereof. 20. The mild, multi-phased body wash composition of claim 17, wherein said pattern is selected from the group consisting of striped, geometric, marbled, and combinations thereof. wherein the particle is selected from the group consisting of natural, synthetic, semi-synthetic, hybrid, and combinations thereof. 22. The mild, multi-phased body wash composition of claim 17, wherein said nonionic surfactant having an HLB of from about 3.4 to about 9.5. 23. The mild, multi-phased body wash composition of claim 17, wherein said composition additionally comprises an optional benefit component selected from the group consisting of vitamins and derivatives thereof; sunscreens; preservatives; anti-acne medicaments; antioxidants; chelators; essential oils, skin sensates, and mixtures thereof. 24. The mild, multi-phased body wash composition of claim 17, wherein said structured domain is an opaque structured domain. 25. The mild, multi-phased body wash composition of claim 24, wherein said opaque structured domain is a lamellar phase. 26. The mild, multi-phased body wash composition of claim 17, wherein said electrolyte is selected from the group consisting of sodium chloride, ammonium chloride, sodium sulfate, ammonium sulfate, and mixtures thereof. 27. The mild, multi-phased body wash composition of claim 17, wherein said composition is substantially free of a polysiloxane. 28. The mild, multi-phased body wash composition of claim 17, wherein said composition is substantially free of alkyl amines and alkanolamide. 29. The mild, multi-phased body wash composition of claim 17, further comprising at least about 0.5%, by weight of said composition, of a fragrance. c) removing said composition from said skin or hair by rinsing said skin or hair with water. CN1082365C (en) 2002-04-10 Combined skin moisturizing and cleaning bar compsn.